Whitening your teeth is one of the easiest and most affordable ways to cosmetically improve the appearance of your smile. Even if you are a diligent brusher, certain foods and beverages leave stains on your teeth that normal toothpaste cannot remove. Even a professional dental polish may not get your teeth quite as white as you would like. Because some of those foods are healthy and taste great, we don’t recommend that you stop eating them. Simply brush your teeth afterward and if stains build up, consider coming to Kingsway Dental Centre for a teeth whitening evaluation. Whiter teeth can help you look younger and have more confidence when it comes to smiling and speaking. Don’t let stained teeth make you feel self-conscious when it’s so easy to change. One of the most staining and orally damaging habits is using tobacco. Whether you use cigarettes or chewing tobacco, it can leave serious stains on your teeth and also leaves you at a higher risk for certain cancers like oral cancer and lung cancer. 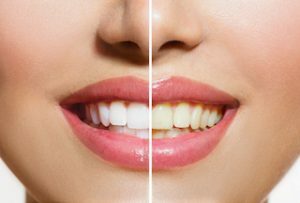 Fortunately, we offer professional whitening solutions to improve the appearance of your smile by bleaching stains and making them virtually invisible. Most professional whitening systems use hydrogen peroxide or carbamide peroxide solutions to brighten your teeth. Both solutions are completely safe when used correctly under a dentist’s supervision, and most patients are pleased with results. Few patients report side effects. The most common side effects are sensitivity to the teeth and gums. Usually side effects subside with less frequent whitening (taking a day or two in between treatments) or by changing the strength of the solution you use. Take-home whitening is the most common system patients choose because of the versatility it provides. It is a more affordable option, and you use when it is convenient for you. We create custom whitening trays for you that snugly fit your teeth. When you place a small amount of whitening gel in the receptacle for each tooth and wear your trays for the prescribed amount of time, you will see results after just a few treatments. You keep your custom whitening trays for future touch-ups if your teeth stain again. Edmonton dentists Dr. Jim Haymour, Dr. Everett Postill, or Dr. George Laschuk can discuss the recommended time to wear your trays and recommend a gel that will work best for you. In-office whitening works best for patients who want instant results. This system of teeth whitening works by placing whitening gel on your teeth and treating it with a special light that activates the whitening solution. Each treatment takes about 20 minutes and we can repeat it several times until you reach your desired whiter shade. Do you have questions about teeth whitening? Call our Edmonton office and our skilled dental team will help you decide if professional teeth whitening will work to give you the dazzling smile of your dreams.